Dr. Jarita Hagans, a 1996 program participant at Howard University. Today, she is a family practice physician, speaker, and author. I’ve had a love of science and service from a young age, and this is a career that lets you combine those passions. I was inspired by the pre-political Ben Carson. His book, “Think Big” was given to me by an aunt when I was 12 years old. I didn’t get into medical school the first time I applied. I taught school for a year while I reapplied. I failed the USMLE (United States Medical Licensure Exam) twice. I had to sit out a semester and go to a test-taking course. But I needed that detour to learn what I was doing wrong and how to master these types of tests in the future. I didn’t match and had to scramble. I scrambled into a preliminary surgery spot and it was a trial by fire. I learned a lot of technical skills that I still use now as a family practice doctor. I also learned how to remain calm in the eye of the storm. What makes you story unique? My road wasn’t a straight one. From my first medical school application until now, I have been a teacher, a student, an associate at Target, a surgeon and now a family practice doctor. My path was filled with a lot of detours, but I still made it. The volume of information that had to be learned. Go into it with as much enthusiasm as you can muster. Grab the bull by the horns! There will be obstacles, but the obstacles strengthen you. Never, never, never give up! Do you remember your first day of graduate studies? What memory stands out the most? I can’t say that I remember the very first day, but one of the earliest memories that stands out the most is the smell of formaldehyde in the anatomy lab. That smell permeates your clothes, skin, books, everything. How did the Minority Medical Education Program (now the Summer Health Professions Education Program) influence you? It gave me a foundation to build on. It allowed me to look into my future and see myself as a medical student. 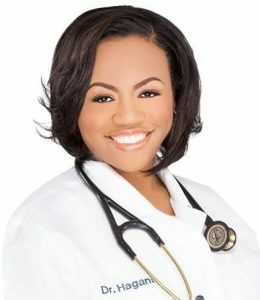 Learn more about Dr. Hagans at www.mddreams.com.